One can only imagine just how the hell this film came into being. 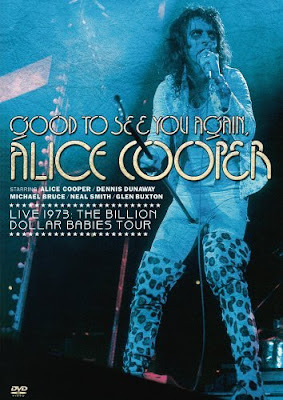 Sure, Alice Cooper was one of the biggest bands in the world during his 1973 Billion Dollar Babies tour, but does that means he needs his own theatrical release? As a film, this project is sorely lacking. The only thing that makes it worthwhile is the actual concert footage. Thankfully, Shout! Factory noticed this and allowed for the option to watch only the Concert footage. It’s pretty weird to see just how outrageous the band actually was at the time. The stage show was incredibly theatrical, but not as much as later Cooper shows. In fact, there seems to be a liberal amount of improvising. The Cooper character from the early days was much more confrontational than these days. Now, Cooper would rather make an audience think, back then, he’d rather get in their face to unnerve them. Watching this footage, you can see how Cooper paved the way for many of the shock rockers to follow in his footsteps. Not only does he use the trademark guillotine and snakes, but he has decapitated baby dolls and dismembered female body parts that he uses as props to make his macabre songs come to life. Seeing Alice Cooper chasing a giant tooth across a Texas street with a huge toothbrush is something I never thought I’d see. The video has been given the old anamorphic widescreen treatment however the elements used are dark and muddy. As a document of the early ’70’s, it’s still in good shape. The audio has been remixed into 5.1 for some reason. It sounds good, but no better than the standard stereo option would have resulted. Ultimately, I’m glad to see the disc exist simply because it’s an interesting period in the history of the Alice Cooper Group. Unfortunately, I can’t see anyone other than fans of the band enjoying this.